Most people associate Limerick with being a funny little five lined poem, but it is also the place in Southwest Ireland where the late Sir Terry Wogan was born and is also home to the Shannon Estuary where Ireland’s longest river, The Shannon, meets the Atlantic Ocean. I recently came across the Keltic Krew on Instagram and they were on a mission to help maintain beards across our nation. To rid the country of whiffy, wirey beards by producing quality beard oils and balms from natural products in Limerick. Of course I had to get in touch with them to see if I could review their product and feature it on the blog. They kindly agreed and sent me one of their balms and an oil which arrived last week, snazzy red on black logo and the fetching blue oil bottle. I’m delighted to say that this is the first Irish brand that I’ve reviewed, and they didn’t disappoint. 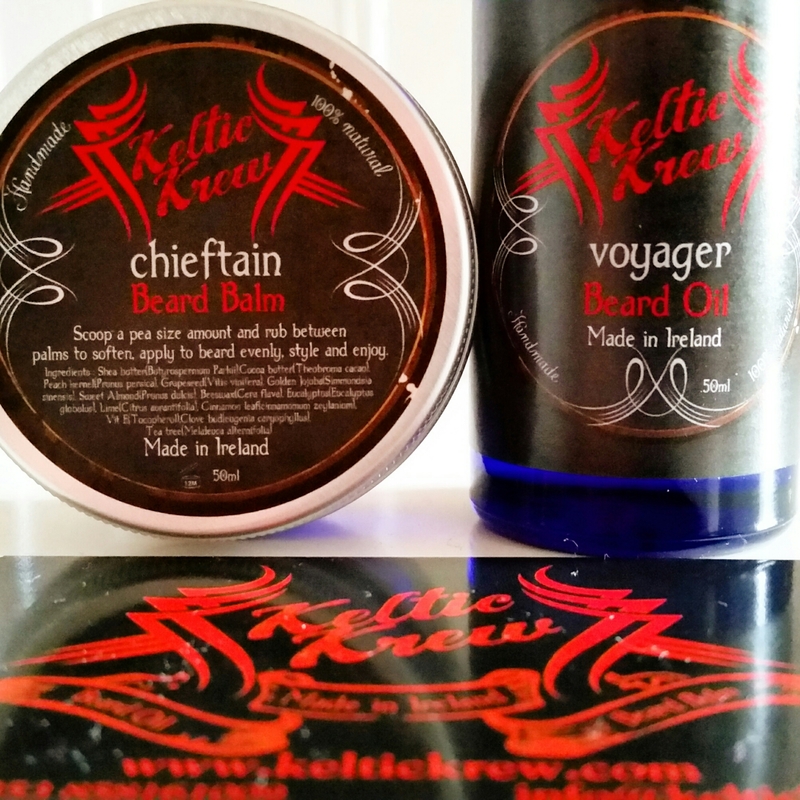 The guys chose to send me Voyager oil and Chieftain beard balm. Two really super products containing high quality oils and butters, hand made in Limerick. Voyager was a wonderful blend of peppermint and eucalyptus with undertones of citrus in the form of grapefruit and lime. This oil was fresh, soothing and was a cracking blend, light, not at all greasy with a big hit on the nasal passages. Its super cool, fresh scent left me feeling like I was sailing down the Shannon with a cool breeze in my beard. Just awesome! I love minty fresh oils, I especially like using them when I’ve showered after a run. I found this one really refreshing, like washing your face in a crystal clear natural spring. 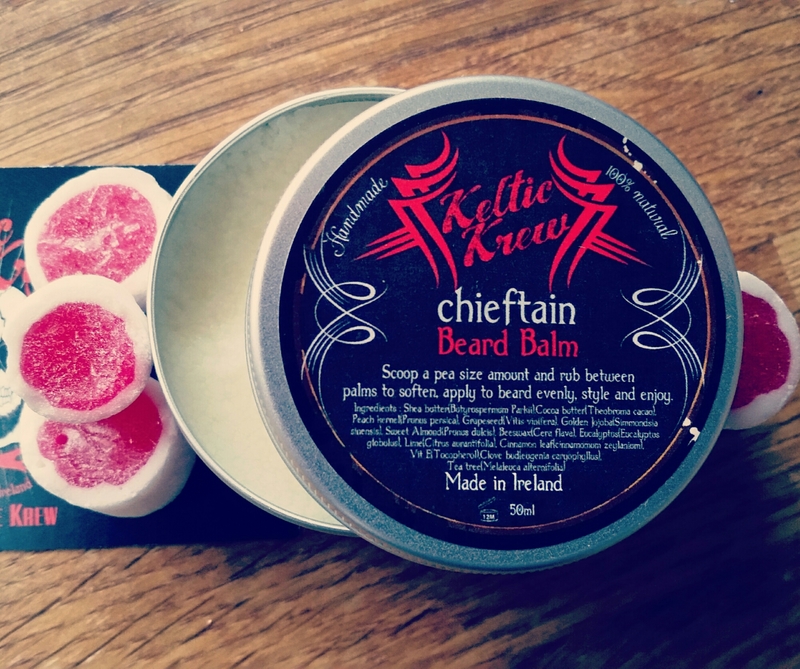 Chieftain is a warm spicy balm like nothing I’ve come across before. Its the most interesting balm that I have used, so much going on and all Is revealed as it melts between the palms of your hands. Cinnamon and clove bring spicy warmth to the party while eucalyptus, lime and tea tree oil bring the soothing tones which leave the beard soft, shiny and smelling just splendid. It really is a great blend and leaves a lovely subtle fragrance to your beard. Both of these products were top notch and its always great to discover new brands from Ireland. They guys have worked hard on their brand and their product and it shows. I have no doubt that this brand will go from strength to strength and complete their mission in ridding this country of whiffy, wirey beards. They’ve won me over.